Altenew and Pretty Pink Posh products complement each other beautifully and they're ideal for making a start on your Christmas/holiday projects! I couldn't resist shaking things up a bit by inking up Altenew's Modern Deer stamp set (again!) and pairing it with Pretty Pink Posh clear 4mm sequins. 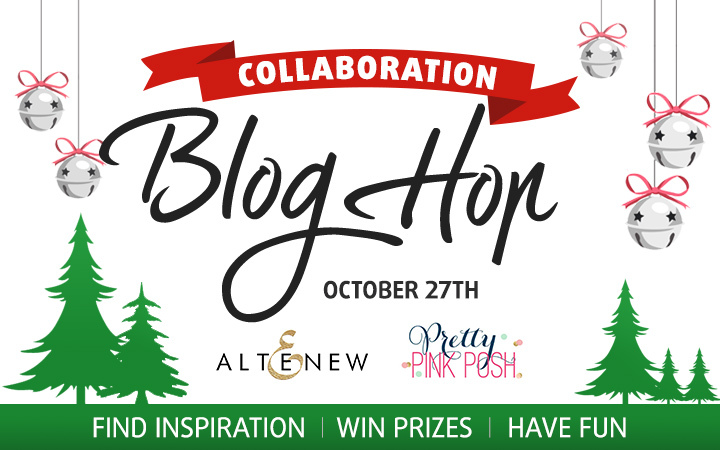 This blog hop is a pretty special one as Altenew and Pretty Pink Posh are celebrating our their first anniversary of collaborating so they're celebrating in style by having amazing giveaways and offers! There's two $100 prize packs from Altenew and Pretty Pink Posh up for grabs. Two winners will be randomly selected from comments left on any one of the blogs in the blog hop. You've got to be in it to win it, so be sure to leave comments by Wednesday 2nd November 2016 at midnight EST. Winners will be announced on the Altenew and Pretty Pink Posh blogs on Thursday November 3rd. Also, if you fancy a little retail therapy, then Altenew and Pretty Pink Posh are offering you 10% off your entire order. Simply enter 'ALTENEWLOVESPPP' at the checkout for Altenew orders and 'PPPLOVESALTENEW' for Pretty Pink Posh orders. Hurry though, the offer is only available until midnight EST on Sunday 30th October 2016. Thanks so much for hopping on by today! The scenery in beautiful and love the deer looks so innocent and adorable! Great idea putting the cabin in the background. It's a gorgeous card. And a shaker!! What could be better? Such a beautiful combo of stamps and techniques. Love this card. I am so excited about this release. It's so hard to choose a favorite. Your card is gorgeous! Beautiful card with some really great details! Thanks for sharing on this fun blog hop!! I love your clean and simple style of this beautiful scene. Thank you for your inspiration! Just absolutely in love with that woodgrain background and combined with that delicate deer....LOVE!!!!! The woodgrain, soft green and tan deer - yummy combination. Lovely, just lovely! the images and the colors all so sweet. An unforgettable card. Thanks for a chance to win. Love the texture and the shaker. I love the color scheme you chose! White, mint and red are great for subtle Christmas colors! 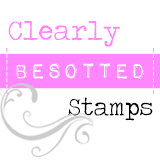 Amy, I love this combination of stamp images! The perfect pairing, and I think I may have to steal your idea ;-) Gorgeous holiday card. What a beautiful card. Loved your colors. What a lovely scene...thanks for sharing it. wow..I just love the scene behind the deer and then to add sparkle it genius! Love the scene in the shaker. The light pastel green also is beautiful. This is a gorgeous card. Oh my gosh! This is like the perfect card with the house in the background and the deer in the forefront. The colors are fantastic too! Absolutely love this! LOve this guy ... may I ask, what are the dimensions of this lovely card? Just gorgeous! You gals have made me want that deer now.... just perfect layered with the PPP stuff!!! What a stunning shaker card! Altenew is my favourite stamp company - especially their stamp layering sets and I love what I've seen ladies do with PPP sequins and sparkles all over the internet. What a great chance to win amazing prizes! Your deer is so cute and I like the was he/she is offset from the cabin in the background. Beautiful scene. I love the softness and then the lovely touch the red twine creates. This card is darling! One of my favorites I've seen on this hop. I love the cabin in the shaker and the wood grain embossing. Beautiful! I loved how you paired these two stamp sets to create a scene with background and foreground dimension. Lovely card. I'm so happy I got Modern Deer!! Gorgeous card and love the jingle bells which make a great finishing touch LOL!! Your card is gorgeous, love the bells! Great shaker card. Super coloring. Amy, I love this! What a fantastic scene, and I love that you stamped it on aqua. The little white and glittery touches are fabulous. Oh Amie, I love the cabin in the background, so cute! What a fabulous card! Love shakers and the scene in the background is perfect. I love the soft colors you used, the result is beautiful. Really a great card. I love this card, this is one of my favorite new stamps. Beautiful card, love the winter cottage scene in the shaker with the Modern deer, so soft and pretty! The little cabin pairs nicely with the modern deer and PPP sequins! Love your card. The deer is so sweet. Oh this is so pretty! I love that little cottage in the background! I love the glitter touches! Beautiful! LOVE LOVE LOVE this - simply stunning! Love the background shaker scene for this sweet deer. I've fallen in love with this deer stamp! Your shaker scene is just beautiful! Gorgeous! I really need that awesome stamp set! Love the icy sparkle! Thanks for sharing! 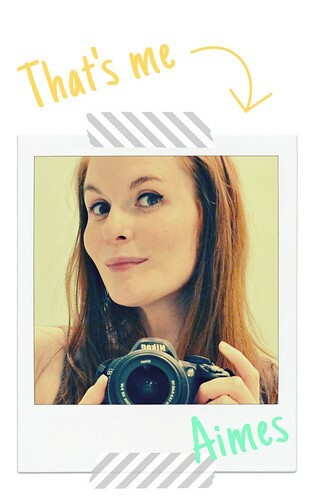 I love your card and this collaboration makes me happy happy happy! Stunning card! the shaker element blends so well. Amy, love the scene you put in behind the deer. The card is really lovely. Thank you for sharing with all of us. Such a pretty card. I like how you used your white gel pen for those extra added details. Perfect. Oh wow this card is wonderful. Love the subtle scene behind the shaker, and then the deer in front. Also love the wood grain on the front. Those bells totally make my heart happy! Your card is beautiful! I love that woodgrain cardstock and it's perfect with your scene. Fabulous pairing of the deer and the tiny house, and setting it into a shaker.. brilliant! Your whole design is gorgeous! I love this little fella up against the wintery scene. The shaker bit is icing on the cake! such an en'deer'ing card!! Sorry, i couldn't help myself. beautiful! I like the circle; it's like a window..and you create what's out there! Lovely theme & sentiment! Love the snowy, icy feel to the card. Pretty colors! Beautiful card. I love all the elements that you used together. The woodgrain really pulls it all together. Gorgeous card, I love the scene as a background for your deer, it looks stunning coloured in the white gel pen and a touch of glitter. I adore the jingle bells too, they look fantastic on your card. Wonderful. I love the way your card elements came together. Thank you. I don't think you could have put together a better sentiment for this darling combination of images. Great card Aimes! I don't think you could have put together a better sentiment with the combination of the images you used. Beautiful and sweet all in one! Ohh so stunning - love the softness! Love the backdrop for your shaker! So pretty. Beautiful, I love the colors and the woodgrain paper. 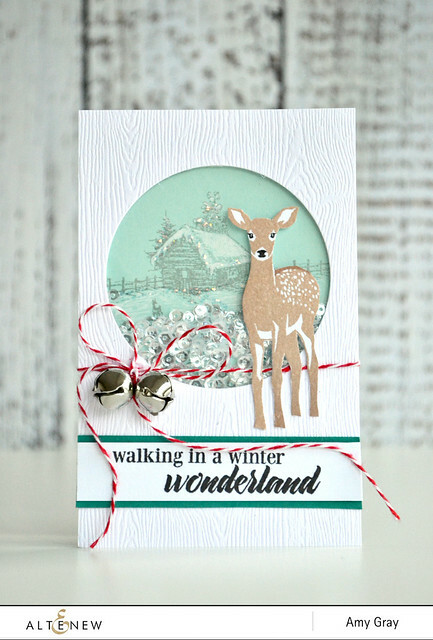 Great pairing of the deer and cabin background to create your stunning card! Just beautiful and serene! That cabin in the woods is so beautiful. Perfect to put that sweet deer in. Love that it is a shaker too. Thanks for hopping and for a chance to win! Love this card. The whole layout is absolutely delightful. Gah! I love the deer! Love your card too. Very pretty, I LOVE that shade of green! Lovely, it feels like a perfect winter scene. This card is gorgeous!! So traditional! The jingle bells are the perfect touch!!!! Your card is absolutely stunning! I love your soft and beautiful layout! Magical scene you created with this lovely card! Love that sweet fawn and the beautiful Winter Cottage! Pretty details with the twine and sequins for your shaker card! Delightful! Your background scene is brilliant! Great card! Awesome card!! I just love shaker cards! This is super sweet!! I love the mint green background - such an unusual color combo that is so effective!!! The deer is so elegant! So pretty! Love that wood grain and the twine and bow add just the perfect touch! This is SO pretty! I love the soft colors, the deer, and the beautiful sentiment! This is another favorite! Love your beautiful shaker card! It is a winter wonderland! Very pretty! Love how you used the wood grain. Cute! 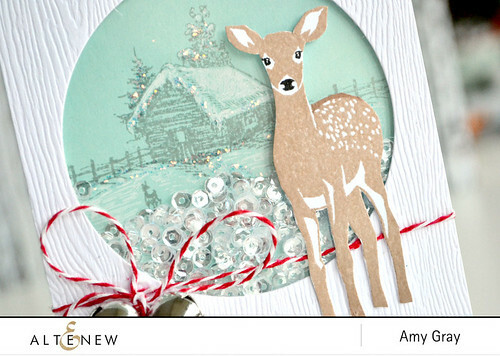 Another gorgeous shaker card - love the sequin mix you used and this deer stamp is just so sweet. Just a delightful card. Love the scenery and the sweet deer. Beautiful scene. Great use of the two stamp sets. Love the shaker and the jingle bells. Love jingle bells for Christmas. Beautiful layout on this card! I have the cabin, now all I need is the deer! And it's a shaker too! Awesome! Thanks for sharing in the amazing blog hop! Love how you placed the snowy Chalet in the background and the deer in the foreground very nice card. Love the texture in your card. Great card, the cabin and the deer work well together, and the jingle bells are a nice touch! I can't believe you colored that! Amazing! Beautiful card, I love your winter wonderland with all the soft colors. I love this on the green background! What a great idea! What a beautiful card! Just the right touch of fun with the jingle bells! Love the icy cabin look. One wow factor after another! Love the deer and the softly colored cabin, the woodgrain cardstock is perfect, and then you added the jingle bell. it all comes together so nicely. Such a lovely card. The red twine and bells are just the right touch. So beautiful! Love the wood grain and soft colors. Thanks for sharing! Amy, your shaker card is stunning and perfect! Love the beautiful shades of blue that you combined with the simple red and white baker's twine. What a fabulous collaborative hop, enjoying seeing all of my favourite Altenew products teamed up with Pretty Pink Posh. Thanks for the inspiration and chance to win! What a beautiful card - I absolutely love those jingle bells! Such a festive look! I just love this card. It just might one of,if not my favorite on this blog hop! Thanks for sharing your talent. Oh WOW!! This is STUNNING!! I love the wood grain you used and the deer. Great design! I love the beautiful scene agains the woodgrain! So sweet! Love the colors and the scene in the shaker is perfect. Those bells are darling too! I love the minty green coloring in your shaker and the deer is so sweet! The images and the colors all so sweet. I love your sweet scene card! I'm a sucker for shaker cards! I love this card, beautiful! Really pretty! I would never have thought about using that mint green color for the background of the house scene, but it really works and is so beautiful with the sequins. Such a lovely card!! The snowy scene inside the shaker is calm and serene! Love it! Great card! I love the scene you created with the deer and the cabin. And then making it into a shaker just puts it over the top!! The pairing of these two stamp sets in beautiful! The embossing of the wood grain just sets it all off perfectly! Thanks for sharing and inspiring!!! Such beautiful coloring! Great card. Super gorgeous card Aimee - LOVE me a shaker!! Fabulous showcase. What a beautiful card! I am not sure I would have thought to do this but I love how it looks!! I may have to craft lift this idea because I love it so much!! TFS! Love the shaker card. Well done. PPP has such fabulous sparklies. Wow!! Gorgeous stamping, love the woodgrain background too!! Absolutely beautiful!! Great shaker card! Love the bells too. So pretty! really pretty. Luv the mint green color! Love your design - I love shaker cards - and I love how you used bakers twine and bells. So Christmasy! This is beautiful,I love this card. I love this card, I'm buying the cottage stamp tonight! Thank you for a job well done. Your first card is CAS loveliness! Short & sweet and to the point - fabulous! Love the Modern Deer Shaker too - I gotta have those new dies! what a wonder scene, I felt like walking in the winter wonderland. a wonderful idea for the cottage stamp. an open window and shakes for the snow. Altenew October Blog Hop Winner!